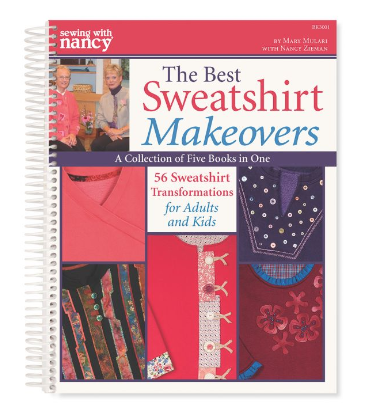 We are kicking off this Sewing With Nancy season with The Best Sweatshirt Makeovers. For many of us, sweatshirts are a wardrobe basic. Decorated sweatshirts have played a starring role during many seasons. Looking back at all the styles created, we decided to feature the 2-part series with guest Mary Mulari, a self-proclaimed goddess of embellished sweatshirts. You’ll find sweatshirt favorites recorded over several years of programming. This series features some of our favorite makeovers. The most frequently requested upcycled sweatshirt style is to change a pullover to a cardigan. 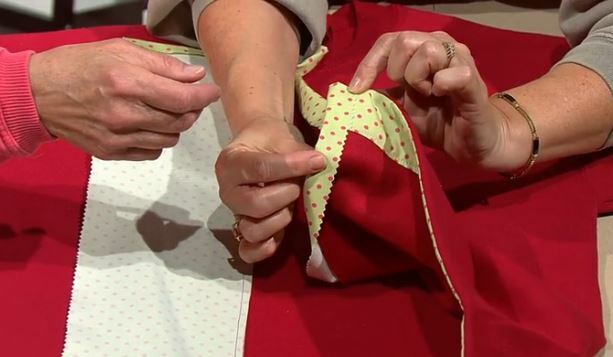 Learn the quick and easy transformation techniques along with appliqué tips and techniques. Appliqués can be subtle or dramatic. Mary’s striking decorated sweatshirt is the perfect choice to wear while strolling through the farmer’s market! The impressive appliqué cascades across the front of the cardigan with artful flair, yet it requires a minimum of creative time. 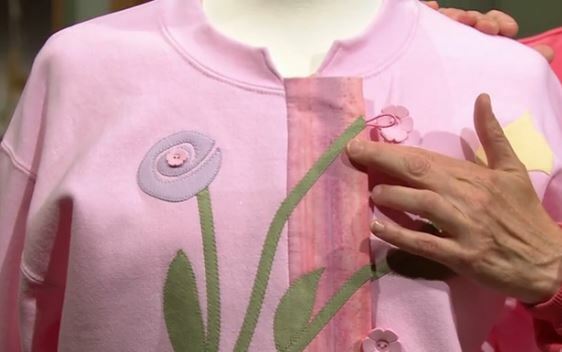 Watch The Best Sweatshirt Makeovers Part One for Mary’s tips on adding appliqués across the front. Mary and Nancy break the rules in this episode! 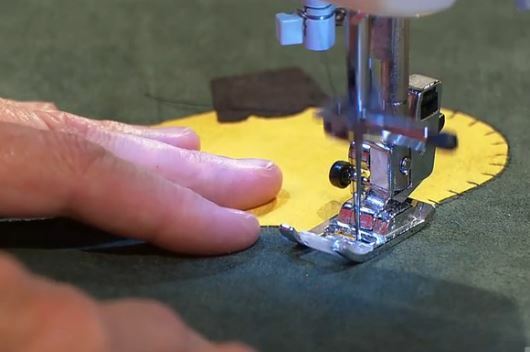 See how to change up the button placement with irregularly spaced buttons for a clever closure. In The Best Sweatshirt Makeovers book, you’ll find directions for Mary’s famous elastic button closure, pictured above. Now it’s time to feature a few all-time favorite sweatshirt makeovers for kids. Pulling a sweatshirt on or off a little guy can be a challenge. This Construction Zone Sweatshirt with Mary’s signature easy-to-apply zipper not only makes this an easy sweatshirt to wear, but also gives a point of interest to the pullover. Add an appliqué to ensure that this will be your little guy’s “go-to” shirt on a cool day. Don’t stop there. You can place a zipper at the raglan sleeve for even more visual interest and style. 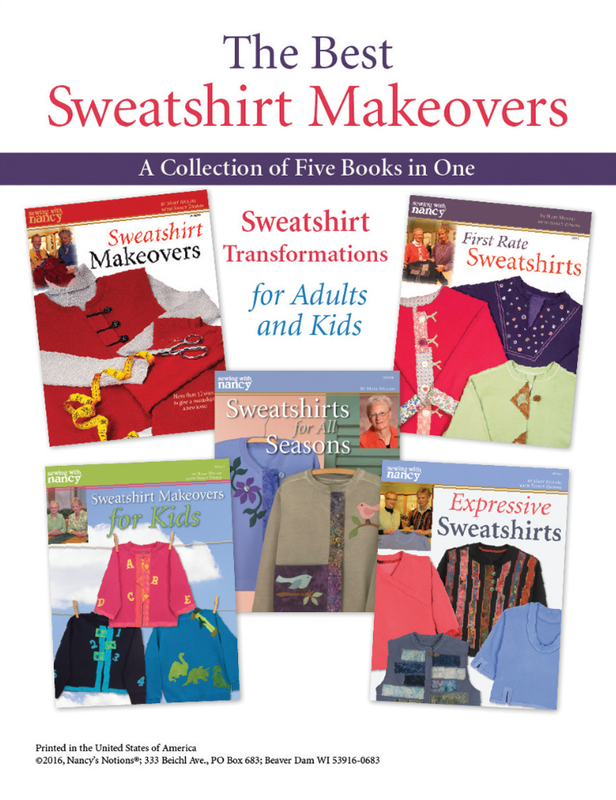 When choosing our favorite sweatshirt makeovers for this series, the goals were simple: Make certain the sweatshirts have a focal point and that the sewing is easy. The Ruffles and Frills Sweatshirt options certainly fits the criteria! The ruffled detail of satin stitching on the ribbing is a special effect that is enjoyable to sew while adding subtle frills. 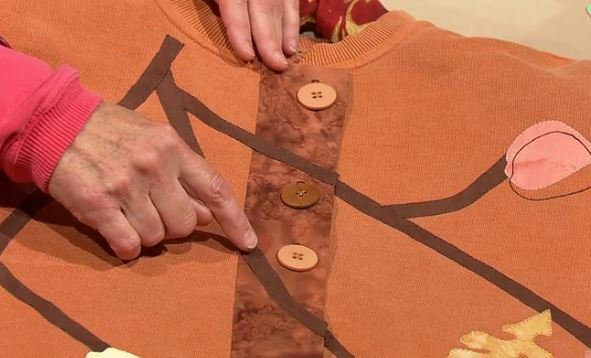 Watch The Best Sweatshirt Makeovers on Sewing With Nancy online. 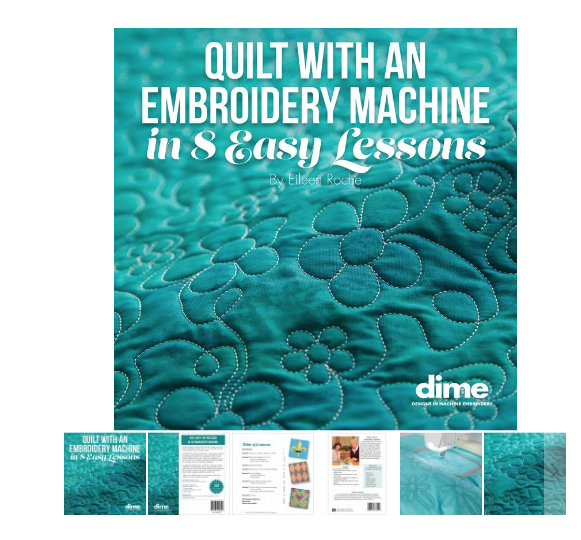 The randomly selected winner of a copy of Quilt with an Embroidery Machine in 8 Easy Lessons book is Daniel. The comment is: When I was around 12 years old back in the 80s, I remember seeing Nancy’s show for the first time. I was fascinated by how easy she made everything look and by her confidence at the machine. I grew up watching my grandmother, grandfather, and my mother sew, and then I started learning. Nancy and her guests were a big part of my education, and the piecing and quilting fascinated me. I likened the process to artists creating paintings, but they were creating art with fabric. 35 years later, I still refer to Nancy’s episodes when I need a refresher. 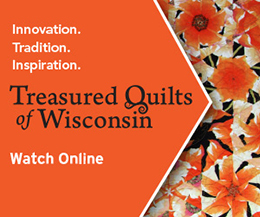 I’m just learning to quilt with my embroidery machine, and this looks like a great resource. Truly love all the ideas that are shown, but I am so impressed from transforming a plain pullover sweatshirt into a stunning cardigan. The ideas for enclosures and embelishments are so clever. I love the idea of cutting open a sweatshirt and adding a button placket. Adding the cute appliqués is a great idea too. I really like the pink sweatshirt with the hearts. What a wonderful book for creative inspiration! I love all of the designs, especially the cardigan with across the front appliques. I love the cardigan with the hearts on it. It is very cute. They are all great ideas, but I love the idea of putting a zipper in the raglan sleeve for visual appeal and for helping those the little one head go through the neckline just a little easier. I have a little grandson that I would love to make a special sweatshirt for. I love them all! But, my favorite sweatshirt makeover is the cardigan type ones. The possibilities are endless! I love the across the front applique. 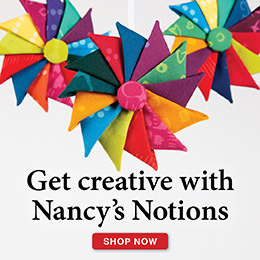 The possibilities are endless, from floral designs to the cat’s or dog’s tail, to a kite tail, etc. Can’t wait to try one. I love the pink one with the offset buttons & the flowers appliqued across the front. So cute! I like the floral applique sweatshirt. I have made five sweatshirts for myself from Mary Mulari’s patterns. I love them. I’m ready for some new ideas! I love the ruffles and frills sweatshirts! It’s so nice to be able to transform a sweatshirt i to something beautiful! All of the sweatshirts have a creative touch all of its own, and I have to say I love them all, but I love zippers, so I will have to pick that one as my favorite. 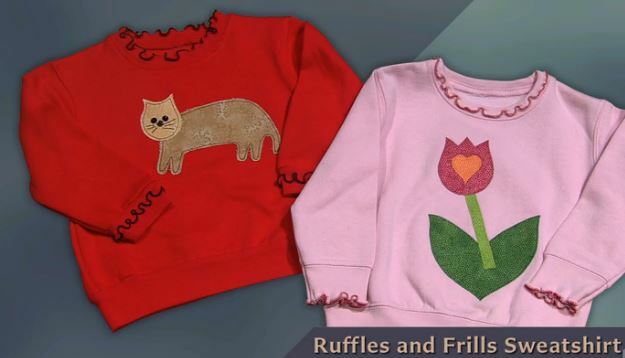 The different closures, using different stitches to applique on the designs and the various designs and decorative touches make each sweatshirt a unique item of clothing. Thanks for the chance to win this book. 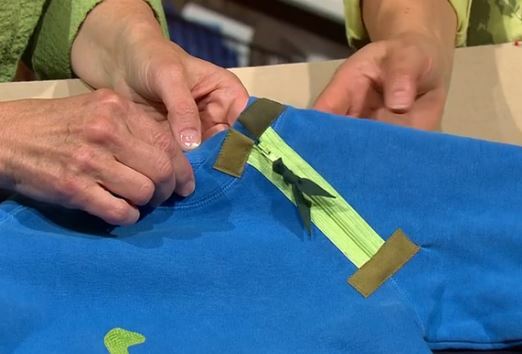 Adding zippers to a sweatshirt for ease of kids is a great idea. I’d love to give it a try. Believe this 5 in 1 book would be a great resource. I love the ruffles and frills sweatshirt. It looks so feminine. My granddaughters would like to wear them. My mother-in-law loved making cardigans out of sweatshirts. I would like to do this myself in memory of her. Cute boy patterns are hard to find so the zipper truck shirt marks all the boxes! The blue one with flowers. I like Nancy’s sweatshirt jacket with the simple placket front and bird applique. 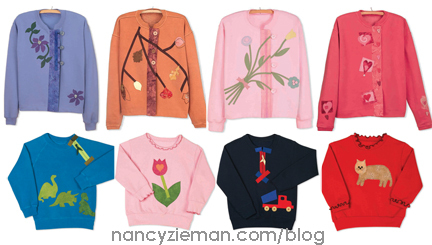 I have been recycling old sweat shirts since I was 12 yrs old, Nancy has some great idea’s . I loved her so much. I like the idea of making a sweatshirt into a cardigan. It adds nice interest to a sweatshirt. I like the sweatshirts with appliques across the front. These will go great with skirts, sheaths, or slacks – and be warm! I really love the idea of putting trucks and animals on sweatshirts for the kids. My grandkids would love that. I would very much like to try that. Applique is my thing. I like the comfort of sweatshirts. Transforming a pullover into a cardigan is really clever. I like the elastic button closures as well. I am really partial to the ones that have the applique crossing over the front. 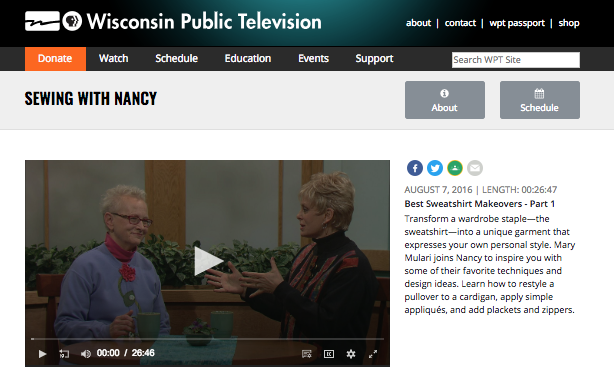 I love re-watching Nancy and Mary exhibit all their ideas for revamping sweatshirts. Making a cardigan out of a pullover is something I would like to try. The Ruffles and Frills are too sweet. My girly little GGDs would love them. I love the zipper placed in the raglan sleeve. I think this has many possibilities. Just converting a pullover to a cardigan sparks my curiosity. My friend Margaret is able to do this fantastically (and coincidentally she won the last time you offered this technique book). The first sweatshirt will be the hardest, but after that, I’m sure I would never look at a sweatshirt the same way. I like the conversion to cardigan with the flowers and irregular placement of buttons. 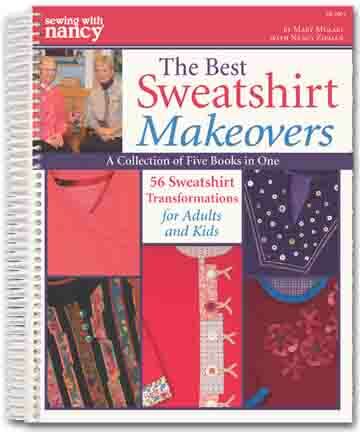 Would love to purchase the book to make cardians of sweatshirts! Very creative!! I love the one with the ruffles!! So feminine! I have some blank sweatshirts and could really use a book like this. My favorite sweatshirt design is the one with hearts. I would have to say the little boy one with the truck. The zipper at the neck would make dressing little ones so much easier. I like the truck. My son sells trucks and his son would love this. Thanks for the ideas. Love the cardigans and the Ruffles and Frills for me and my granddaughter!! Would love to make the front appliqué. Ironically I am doing a patchwork makeover of a sweatshirt as my project this week. I especially like the heart sweatshirt. The addition of appliques on the sleeves takes it to the next level. I like the ruffles on the little girls’ shirts. Time to buys some sweatshirts and get creative. I love the across the front appliques. Also I like the interesting closure ideas. I like Mary’s use of zippers, both useful and decorative. She shows it on a childrens’ sweatshirt, but I think I could use the technique on an adult shirt and make it look unique and fashionable, can’t wait to try. I have a few other books and patterns by Mary and LOVE her easy directions with great results. I was showing off some little bags I made from her Travel accessories book to my sewing group in Arizona and a friend in the group took a look at the book and shouted ” I went to college with Mary Mulari”. I LOVE the polka-dot facing you put on the red sweatshirt! I adore those cute ideas for children. I will be a great grandma this June and would love to make some of those for the new baby. I have been making bibs and doing the appliques on the bibs, and realize how long it has been since I have done that. I really like the clever closures so it becomes a button down front. I love them all. I really like the pink cardigan with the crossing applique. I think it would be beautiful with machine embroidery going across the front or maybe silk ribbon embroidery.